I just finished another contest and had to write to say how well the StackMatches and Six-pack are performing. We’ve designed our station in HC8 for beaming in multiple directions. We have a StackMatch in control of the antenna switching for each band, 80 through 10 meters. When I set up for Single-Op, All Band (see photo), I put the StackMatches and Six-Pack right in front of me because I am constantly changing beam combinations and bands (for moving multipliers). All of the WX0B switchboxes have performed flawlessly! 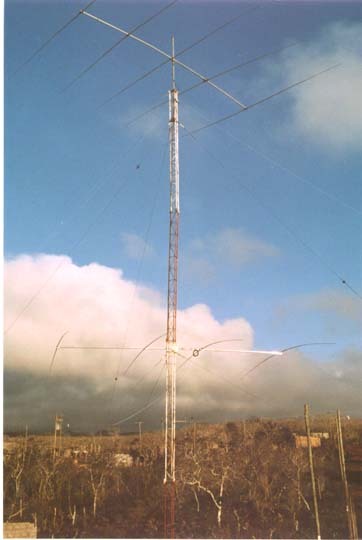 There has never been a failure of any of the WX0B equipment! In fact, the WX0B equipment is the only equipment in our shack which has NEVER experienced a failure! I am completely sold on the WX0B Array Solutions StackMatches and Six Pack. From ease of assembly to flexibility to super reliability, I wouldn’t design a contest station without them!